hey jen renee: I made this last night. I had been searching and searching for a knitting pattern for a coffee cup sleeve that used my beloved Lion Brand Wool-Ease Thick and Quick, but never had any luck. It was driving me nuts. Surely such a thing exists. I have a huge pile of leftovers that I've been dying to use up, so I finally just sat down last night and made one on my own. I'm not a pattern writer by any means, but this is so simple that even I can spell it out. So here you go (you can find this here on Ravelry, too.) These are insanely quick to make, are great for stash-busting and would make perfect last-minute gifts. That is it! Yup, 20 stitches, 12 rounds ... um, this could be the easiest fastest project in the world. Go forth and make coffee cup sleeves. It's December, people. Go, now! Jen, I love this! I'm not really a knitter, but I've been going coo-coo over yarn lately and making quick little projects. This will be an excellent addition to my repertoire. 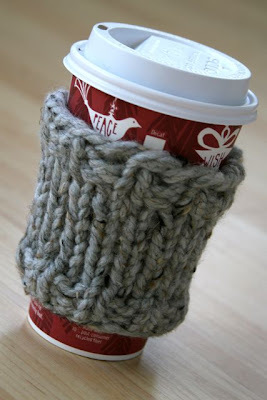 Why am I compelled to knit my Starbucks cup a damn sweater? I don't know, I just am. Probably because they're so cute. Oooh. Love how thick and warm it looks!! :) Lovely! Great idea! My daughter and I have been working on knitting scarves for gifts. This will be a fun project to add to our evenings. that's rad fo' sho...how are you?? where ya beeen??? Okay I am in love with that coffee sleeve. Oh how I wish I could knit better. Would you be willing to sell any online? I want one:) So cute!!! So different then all the others. I taught myself to purl today!!! YAY, I am past the basic knit stitch!! !